The Spokane Tribe of Indians has recently won big victories in its long fight against uranium contamination, including a deal reached this fall between the federal government and mining companies to clean up the long-closed Midnite Mine on the reservation. In addition, tribal members in September became eligible to receive federal compensation if they became sick while working at the mine. "It is good news the mining company was finally forced to take responsibility for the mess they've left in poisoning our land and people," said tribal member Deb Abrahamson, founder of the SHAWL Society, which for a decade advocated to clean the mine site and compensate workers who developed cancer and other illnesses. The U.S. Environmental Protection Agency recently announced a settlement with Newmont USA Limited and its subsidiary, Dawn Mining Co., to spend $193 million to clean up the 350-acre Superfund site where the uranium mine operated. While Newmont will pay most of the costs, the U.S. Department of the Interior will contribute $42 million for failing to fulfill federal trust responsibilities to the Spokane Tribe through proper oversight of the open-pit mine. In a statement, Newmont said it is "committed to ensuring a responsible cleanup that is protective of human health and the environment," and that "the remedy in the consent decree will create employment opportunities within the local community," including the Spokane Tribe of Indians. "We're happy to finally see the light at the end of the tunnel," said Jamie SiJohn, a spokeswoman for the tribe, whose reservation is just northwest of Spokane. The Midnite Mine operated from 1954 to 1981, providing a key ingredient for nuclear weapons at the height of the Cold War. Up to 500 people worked at a time at the mine, blasting nearly 3 million tons of uranium ore out of the hillsides. Among the cleanup actions over the next decade will be draining water from two open pits, which are up to 500 feet deep. Also, 33 million tons of radioactive waste rock scattered around the mine site will be moved into the pits, which will then be covered to keep surface water out. Ongoing maintenance will include removal of water that enters the pits. 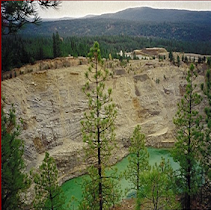 "The cleanup will bring important environmental protections to residents of the Spokane Indian Reservation, including the control of radioactive mine waste," said Ignacia S. Moreno, an assistant attorney general with the U.S. Department of Justice, in a press release. Meanwhile, a recently completed epidemiology study of the 2,700-member tribe conducted by the state Department of Health and the Northwest Indian Health Board concluded there were high rates of cancer among tribal members who worked at the mine. That qualified them for federal compensation of between $50,000 and $100,000 per person, Abrahamson said. It's not clear how many tribal members will ultimately get compensation, as many miners have died and some are declining to file for payments, she said. The SHAWL Society's task now is to set up a clinic to help people become eligible for compensation, she said. They need to be medically screened and then fill out applications, she said. The complicated process has been a barrier to compensation for members of some tribes, and Abrahamson is trying to set up a team of attorneys to help Spokanes get qualified. 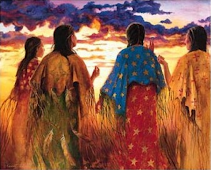 "That's how the Navajos met success, they had attorneys," she said. The majority of the workers at the mine were Spokanes or members of other nearby tribes, Abrahamson said. Women of the tribe have contracted cancer from cleaning the clothes of the men who worked in the mines, Abrahamson said. Many members of Abrahamson's own family became sick. "It has really varied on how radiation impacted people," she said. "Some died right after they worked out there in the 1970s. Others have gone 20 to 30 years and then cancer emerges." Former miners have also suffered from renal failure, rheumatoid arthritis and lupus, she said. "I'm really hoping that former workers can benefit and that justice, or at least a piece of justice, can happen for them," Abrahamson said. Another issue is that the federal government compensates workers who labored at uranium mines only through 1971, when it stopped buying uranium for nuclear weapons, she said. The Midnite Mine operated until 1981, selling uranium to commercial nuclear power plant customers. Abrahamson wants to get compensation for people who worked there between 1971 and 1981. It's been known for some time that the mine site posed serious health risks. Dawn Mining has long collected and treated water from the site before pumping it into Blue Creek, a tributary of the Spokane River. The treatment, ordered by the federal government, removed radioactive materials and heavy metals. The federal government also recommends spending no more than one hour a day at the mine site to limit exposure to radiation and radon gas. People shouldn't eat berries or plants gathered from the Blue Creek drainage, where the mine is located, or fish from the creek, according to the Agency for Toxic Substances and Disease Registry. Meat from deer and elk that forage in the drainage could also pose health risks from heavy metals and radiation, the agency has said.